All Things Dog Blog All Things Dog Blog: Canine Camping Winners Hit the Woods! Canine Camping Winners Hit the Woods! Let the camping begin! Our Petco giveaway of camping supplies for Fido has closed and today I have winner announcements. What a terrific way to start the Independence Day weekend, planning another fun Summer getaway. Tigers and Leopards for Playtime! One lucky winner scores a pup tent and a bedding blanket that folds up to fit whatever space is available. In the photo above, Oliver is sitting on the blanket as it is folded in half. This blanket is large and has nice batting for comfort. The tent, pictured below, comes in a plastic carrying case to keep it clean and dry till next year's camping season. Our best tip for a long tent life is to assure that the tent is wiped out and dry before rolling it up and storing. This will help to assure that you don't reopen it next year to mold or mildew. Prevent is key! While you're out in the woods relaxing around the campfire, Fido will need some fun ways to enjoy his time. Two of our winners will receive a wild animal toy appropriate for most sizes of dogs, along with a surprise from Petco that is sure to delight every pup. 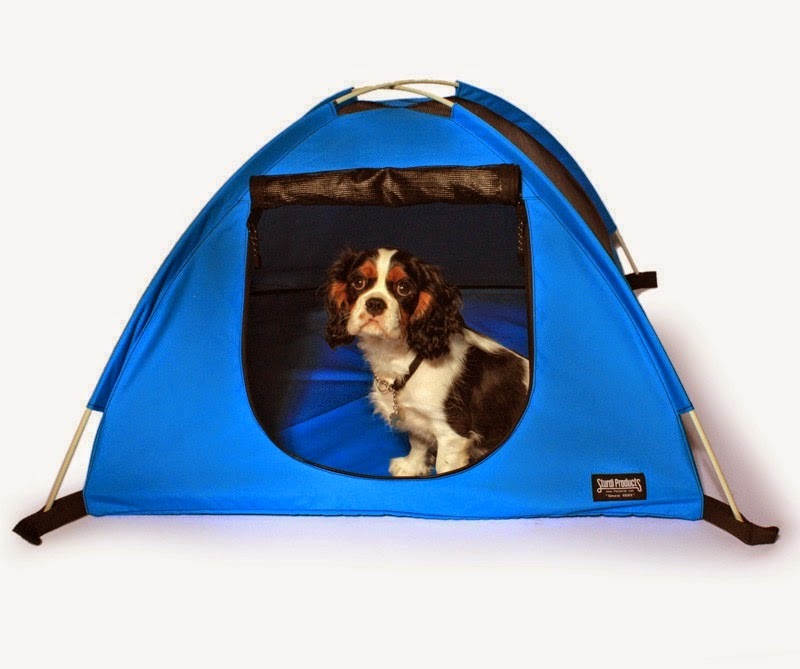 You can learn more about the tent and about Petco by referring to our review, linked above. On their website, you'll find other great supplies for camping, including the all important prevention for fleas, ticks and mosquito-born illnesses. Be sure to treat your pup with appropriate methods to prevent any problems from pests. We recommend you get your "pupatrician's" (aka veterinarian!) advice on this topic. Be safe and have fun! One final tip. Never leave home without an adequate supply of your dog's regular food. Changing food abruptly will often lead to digestive upset which could disrupt the camping fun. Shop Petco.com for our favorite: ORGANIX organic dog food. You'll find other travel tips appropriate to camping here and here. Our winners are M. Tabora, S. Cole, and C. Joslyn. I'll be in touch via AllThingsDogBlog@gmail.com. Watch your inbox and your spam file for my message requesting your address for shipping, and other details. Petco has provided these products for promotional giveaway. I have not been compensated to tell you about them and the comments above are my own thoughts.